After publication in No. 5 of our magazine for 1972 article “Three wheels instead of four,” we received hundreds of readers ‘ letters with a request to send or publish drawings of three-wheeled micro-car, only “Friendship”, built in auto-design circle school No. 200 Timiryazevsky district of Moscow on the project of teachers Bykovskiy, G. Malinowski and B. Horev. No less — if not more — it’s letters directly to the school, where he created the first micro-car, only “Friendship”. The interest of young technicians of our country to this machine was so great that many specially came to Moscow to the Exhibition of achievements of national economy of the USSR, where it was exhibited. ENEA, one of the creators of the machine, grader Leo Saparov, showed bridging with full speed lying on the ground of a Telegraph pole. That he turned out perfectly: the machine, as a living creature, jumped over the obstacle, leaving at present the slightest doubts that it could overcome the more thick log! And in 1970 and 1971 “Friendship” participated in two large demonstration rally to the Soviet Union “clocked” on the speedometer is about 40 000 km! 40 000 km without a single breakdown or accident — isn’t that the best recommendation for cars made by schoolchildren? And when you consider that it, also, mastered the art of driving half a dozen people, it becomes clear how unpretentious this little micro-car. During the run of his drivers were often changed. Among them were very young, was quite gray-haired veterans of the sport with half a century of experience behind the wheel. And all praise this small, unprepossessing in appearance, but so amazing in their characteristics machine. Fig. 1. 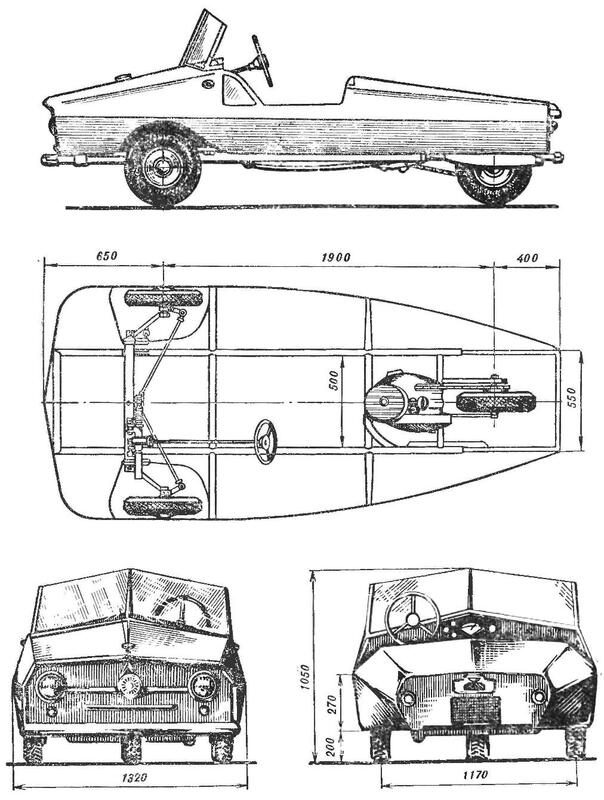 Schematic drawing of tricycle: side view, top, front and back. Today in our magazine story on “Friendship” begins one of its creators — the teacher Viktor S. KHOREV. Little micro-car “Friendship” is, essentially, a hybrid car, motorcycle and scooter. For the construction of the machine were used the following components and parts prefabricated position: front axle, steering from a sidecar “С3А”; the engine of the motorcycle “Chezet-250” (with a reworked air-cooled scooter “Chezet-175”); power train, drive sprocket and rear suspension of the scooter “Tula 200”. Connecting all the parts of the machine is a welded frame, which is on the front of the shoes, which configuration is made in the shape of the front axle “С3А” (or “ZAZ-966”). The frame is welded from tubes Ø 46 mm. To the rear of the frame welded two pipes with Ø 30 mm for mounting the pendulum suspension of the drive wheel. Welding produced by the welding at normal voltage (large can be burning). Tilt and installation of pipes shall be verified on a pre-made template. Better to weld in one or two points, and then conduct the final welding. The pendulum suspension of the scooter “Tula 200”. The shock absorbers used in motorcycle “Pannonia”, the frame attachment customized in accordance with the dampers. Mud flaps are made of thin sheet metal, they protect from dirt and water in the motor part. Front axle “С3А” redone; the front wheel hubs set brake drums (see drawing in the magazine “M-K” No. 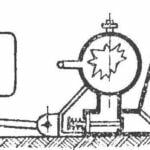 2, 1967); the shock absorbers are replaced by spring-hydraulic, from a motorcycle “Pannonia”, which is much improved driving characteristics of the machine (see drawing No. 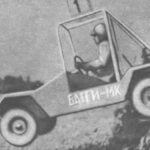 1 “M-K”, 1967). “Elastomer” micro-car, only “Friendship” of the scooter, 4.00X10. Engine “Chezet-250” — forced cooling to ensure the normal temperature for the fan cover “Chezet-175” added additional air guides. Used muffler from a motorcycle “Chezet-250”. The gas tank is up front, fuel tank capacity 20 litres, which is enough for 500 km. Fuel feed is by gravity. Fig. 2. The overall layout of the tricycle “Friendship”. View A: 1 — frame No. 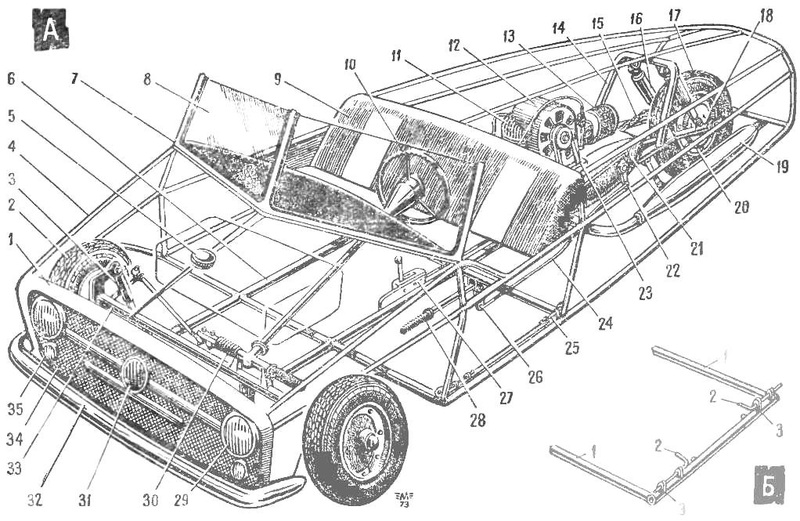 1 carrier for facing the front of the machine; 2 — the right front wheel; 3 — suspension of the motorcycle “Pannonia”: 4 tube frame, Ø 15; 5 — neck of the fuel tank; 6 — pipe of the supporting frame, Ø 46; 7 — windscreen frame; 8 — windscreen; 9 — seatback; 10 — steering wheel; 11 — engine; 12 — casing of the blower; 13 — carburetor air filter; 14 — frame suspension drive wheel; 15 — a leading chain; 16 — suspension of the motorcycle “Pannonia”; 17 — driving wheel; 18 — pendulum fork suspension of a back sprocket; 19 — damper; 20 — brake drum; 21 — the lever of switching gear; 22 — Nik lever-starter; 23 — V-belt drive blowers; 24 — nick the pull-starter; 25 — a bolt that secures the body to the frame; 26 — knee lever, kick-starter; 27 — arm shift lever; 28 — arm lever kick starter; 29 — headlight; 30 — rack and pinion steering gear; 31 — sound signal; a 32 — bumper; 33 — upper beam of the front axle (С3А); 34 — veneer: 35 — sidelight. View “B” — location of latches that secure the body shell to the frame; 1 — 1 — cross-section pipe frame, 2 of 2 latches, 3-3 — brackets latches. The steering wheel is taken from the sidecar “С3А”, he is wearing a decorative ring that makes him attractive. By car Druzhba installed the starter lever, hand operated. Control pedal car located in a typical automotive circuit. Transfer them fulfilled by flexible cables. The operation of the clutch and gas the same as in modern cars, the power is transmitted through flexible cables Ø 3— 4 mm. The hand brake operates simultaneously on all the wheels. The Parking position of the brake is provided with a comb on the handle brake. Seat mounted 6-MD – bolts, but with a larger head. The body frame of the car “Friendship” made of tubes Ø 15— 18 mm, sheathed with plywood and covered with fiberglass epoxy resin (can be covered with calico on the casein). The body of the open type, light, weight — 50 kg. its Peculiarity is that it can be a few minutes removed or raised on hinges, which is a great convenience, as it provides access to all machine components. Wiring diagram of vehicle “Friendship” is very simple: two lights with lamps and low beam headlamps and two turn signal — front and side; two-marker lamp 2 filament bulb (2-thread — flashing direction indicators) rear; lighting of the instrument panel (the panel supplied from a motorcycle “Java”). The “stop” signal runs from the foot pedal, and hand brake. The car is supplied alkaline battery 6V, 22 amp-hours.